Morgan Dollars is a website that will help you grade, value and identify varieties and authenticate Morgan Dollars. If you just buy Morgan Dollars to put away as investment then you’re going to run into very little hassle. These silver dollars are so numerous, with many common dates and mints, and in so many conditions that it will be easy to find collection/lots for a fair market premium. The only points to remember: Cleaned, damaged and extremely worn Morgan Dollars, often called “culls”, often sell for the lowest premiums. You can find the best deals looking for culled Morgans in lots or rolls, just bid what you are willing to pay plus the shipping charges. You can bid on a few lots at a time or just wait until the auctions is almost ended. You might be buying the ugliest Morgan Dollars on the market, but they will have just as much or the same amount of silver as the better condition examples. It doesn’t matter since it’s the silver that’s most important. Also, you can often get better deals on these at coins shows and dealerships. If you want Morgans without problems and want to buy in hope that they will not only increase in silver value, but keep gaining in numismatic value as well, then it’s going to cost you a little more. Instead of buying single coins you should go for lots, rolls and collections but stay clear of the obviously BU (brilliant uncirculated) lot’s, rolls and collections. Look for auctions that don’t describe the coins with hype or over-brilliant photography techniques. Because these sellers are in the business of selling high end rolls and lots, and realize higher premiums than other sellers, year end and year out. It might take a little more effort and searching but you can find nice coins, in the EF-AU range, that contain the same amount of silver as BU Morgans but sell a little less than their uncirculated counterparts. Also, search for newly listed lots, lots with poor images (be cautious if you can’t authenticate the coins), or sellers who listed coins that were left to them, or who don’t sell coins that often. These type sellers are a little “off the radar” and don’t usually get on coin buyer’s favorite lists, and don’t get bids as fast and frequently as the sellers that are regular coin dealers. This area of the market is the most difficult to crack, and is rife with competitors that have deep pockets, and include high-end collectors and dealers vying for the same coins. 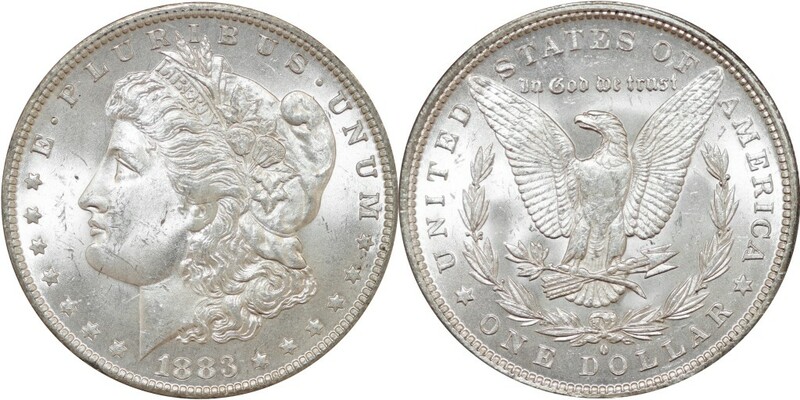 Coin collectors and dealers that look for the “money” grades have years of experience and know how to grade and weed out the auctions with poor images, hyped up descriptions, and “often BU” Morgan Dollar sellers, and have learned the techniques of finding coin auctions with the most potential. It can take years of experience and some losses before you become adept in the “high-end” area of collecting Morgans. Note that this tier of collecting is full of collectors and dealers who look for high grade raw examples (most risky buying raw), or already graded, but look under-graded, Morgan Dollars so they can resubmit for at least a grade point higher. This can mean the difference in a couple hundred dollars or even a thousand dollars when it comes to certain date and mint combinations. (In example, look at the 1896-O values for AU55 to AU58 then to MS60 and do the same for 1884-S, 1886-O and 1883-S just to name a few). At one time or another, everyone makes a grading mistake or two, and takes a loss on a resubmission. However there’s a few points to learn so the amount of losses are less substantial and less often. First, learn all you can about grading and authenticating Morgan Dollars and look through registry sets images, Heritage’s archived coin auctions, and every single graded example you can hold in your hand, and examine them closely and side by side. In the process, buy any book on coin grading, and after doing all of that, continue in your effort to learn more. You just can’t know enough about Morgan Dollars, as well as learning about counterfeits, fakes, altered and cleaned examples, to think you can eventually know everything and stop learning. Second, if it’s not graded by PCGS, NGC, ANACS or ICG, don’t bid. You might think you got a coin’s grade pegged in a lesser holder, and think “If I bid this much then I can live with it not being the grade I think it is”, then you’re only fooling yourself and wasting your time and money. Third, look for PCGS OGH (old green holders), NGC (older, white and “fat” slabs), ANACS (old, small and white holders) and PCI (old green labels) as these are considered the earlier and more conservative grading years for these coin grading services. Fourth, never pay too much or get into bidding wars with other sellers, because it’s not a competition with other buyers. It doesn’t matter, who wins the auction, if you bid past the actual value of a Morgan Dollar. If you want to reap the benefits of your knowledge, experience and grading skills, then put ego aside and bid to win a coin that might get another point, and more value, if resubmitted to the same coin grading service. Fifth, and I think this is the most crucial point, DO NOT believe a coin sellers hype, don’t bid on auctions with multi-colored, large font and bold type descriptions, or mystery dates and mints, or estate auctions, or help me earn money for this or that auctions, or any other appeal to your senses to gain your confidence or make you think you’re getting a better deal or might find a key date in their auctions. If you abide by these 5 points, you will weed out 95% of the Morgan Dollar auctions at ebay, and spend less time finding the dates, mints, and grades you desire, plus save money!